Providing you the best range of wide belt sanding machine with effective & timely delivery. Compressed air consumption 1.5 CBM/min. 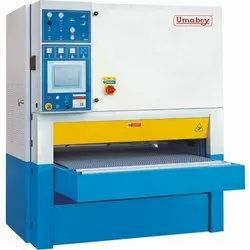 Shree Umiya F-Tech is a foremost manufacturer of Wide Belt Sanding Machine in India. Our firm is the household name in a market to make available the most advanced machinery with higher productivity. It is widely used to give shape finishing the various materials. It has a four different type roller arrangement. It is mainly used for Polishing of wood other materials.